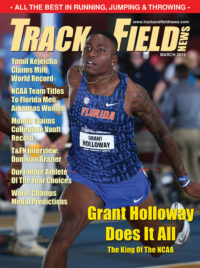 Even in the darkest moments of the 4×4, with 150m to go and the national team title the USC women had worked so hard for pretty much in the dust bin, there were four Trojans who had no doubt a lightning bolt was about to fall from the gray, wet sky to close Hayward Field with a sonic boom. Hill knew what was coming as soon as she finally got the baton to Ellis. “She got it, I saw where she was, I knew she had it,” Hill says. And their head coach, Caryl Smith-Gilbert? 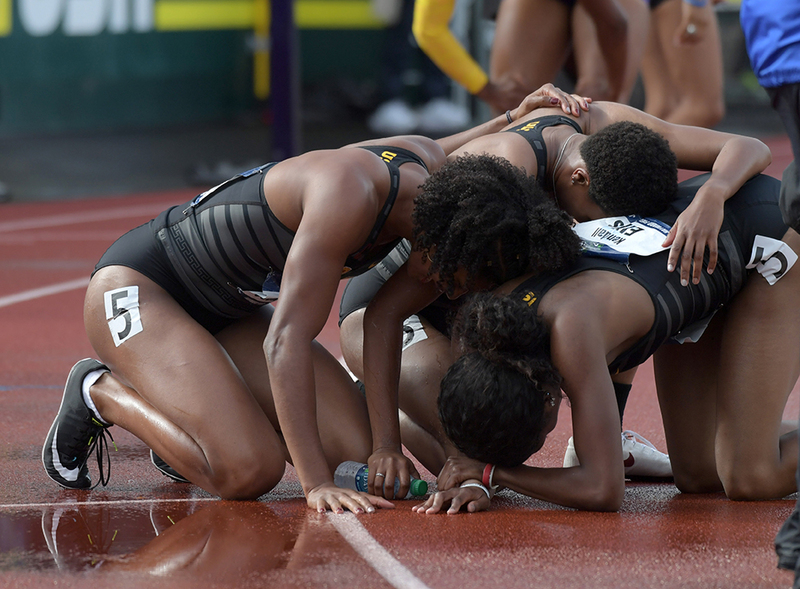 Like everyone else who wasn’t running that race for USC, she had her doubts for several moments after Ellis’ improbable charge from waaaay back, most of that in the dying steps, that pulled her alongside Purdue’s Jahneya Mitchell at the tape. From there, all Smith-Gilbert could do was look up at the board and see what the image revealed. What it revealed was Ellis’s closing 50.05, a 5th-to-1st carry that brought USC home victorious. Even 20 minutes later in the interview tent, Smith-Gilbert had that bemused look of a coach who realizes she has the nuttiest job in the world. “I didn’t know what time they were going to put on the board first, but man, it was good to see it’s you up there,” she says. The breathtaking finish was all set up by some wild swings in the discus and 5000, all going on while the USC 4×4, such a disappointing 2nd a year ago, tried to get ready for their race.